I’ve been home from my trip out east for a week now but I have one last picture (o.k., maybe three) to share with you. I meant to post this WAY earlier but you know, life has been busy, blah, blah, blah. On our way back to Boston last Tuesday we decided we still needed to see Hyannis Port, site of the Kennedy compound. It was basically on the way to the airport if you didn’t mind an extra mile or fifteen. Of course, finding the Kennedy compound is much like searching for a stealth bomber. It seems to be totally invisible to the naked eye. We did come upon a road that clearly stated that we should not enter it, which sometimes doesn’t deter me, but since there was mention of surveillance cameras I decided it would be in my best interest to turn around. Though I doubt this was the Kennedy compound, I like to pretend that I was very, very close. Why, I don’t know. 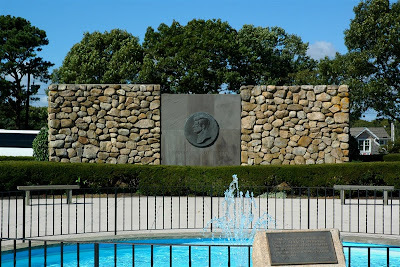 What we did find, and were able to view, was the JFK Memorial garden. It was a beautiful site overlooking the Atlantic Ocean and best of all, it was free to visit, which was good because we were out of money at this point. 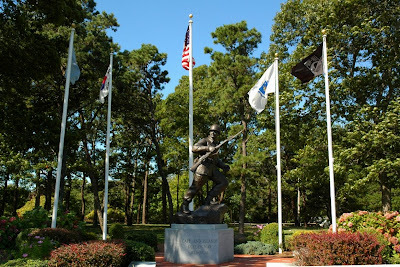 Right next to the JFK memorial was a Korean War Veteran’s Memorial. That too, was a beautifully crafted memorial. As I approached this Memorial I found a man sitting on a stool leaning over working on the brick sidewalk. Many of the bricks had names engraved in them and I figured he might be replacing a brick or adding a name. As I approached him I asked him if he was adding a brick (I’d been behind him up until this point so I wasn’t just being dense.) 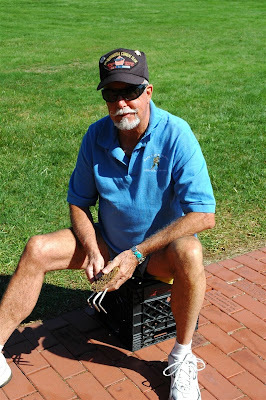 He told me no, he was just cleaning out the grass between the bricks. I was somehow sure this wasn’t a paid position and inquired if he was just volunteering his time. His answer gripped my heart. He informed me that yes he was volunteering his time because he’d served in the Korean War with some of the guys for which the Memorial had been erected. For a few minutes I was choking back tears that I couldn’t quite explain. Here was a man spending his day “taking care of his friends” who had long since left this earth. What a testimony to his respect for his fellow soldier. Once I knew it would be safe for me to attempt to utter a word without fear of having to stop midstream to hold back the tears, I simply thanked the man for serving our country. I took his picture as a reminder of the sacrifice he made in a war fought before I was ever born. I know nothing more of this man other than the obvious fact that he has a servant’s heart. One which blessed my day. This entry was posted in Uncategorized on September 29, 2008 by Nancy. What an experience and what an awesome man to meet!